Separated by only ten days, Myanmar’s Cyclone Nargis and China’s Sichuan Earthquake changed the lives of millions of people in mere moments. Bewildered survivors now cope in the aftermath. How many hearts have been opened? Only God knows, and He has mobilized His army to reap as much harvest as possible. I’m happy that Heaven’s Family (that includes you) is part of that army. In this update, you’ll read about open hearts, miraculous deliverances, and compassionate soldiers of Christ in China and Myanmar. And don’t miss the encouraging reports about our rescue of a Muslim family that has recently turned to Christin an Islamic nation, the answered prayers of a widow in Sri Lanka, and the multiplication of water filters to believers across East Africa. God, working through you, has made all these things possible. Thanks so much. Because of the amount of relief work that Christians are doing in the area, many local people asked us about our faith. Several people became believers! One thing about this trip to the earthquake zone that really left a deep impact on me were the stories about how God protected believers. We heard four amazing stories of divine protection. I will share one with you for your encouragement. A group of believers were meeting together to pray. As they were praying, a minor, but loud car accident caused a commotion outside of their meeting place. They all went outside to check it out. Just seconds after they all were outside the earthquake hit and their meeting place collapsed behind them. God spared them all! There is a stream [near that village] which is just stagnant and joined to the sea of India. When the cyclone raised it beated the village vehemently and drive away 90 peoples as well as oxen, pigs and others cows into that stream. No body took out the corpses and carcasses from that stream and no man buried them also. After one week their corpses and carcasses are so rotten and full of bad smell. The victims drank that stream water and their physical body sensed in pain and sickness. Not only that, but the cyclone drive away all the paddy and rice whatever they collected into the barns for at least one year. Then they have no vessels to cook food and they steeped rice into water and they ate it but it has given them some problem in their body and thay got pain and dysentry. When I looked and saw how they are poor and needy, I could not restrain my heart and I gave them all what I brought and we faced some trouble on the way of going home. But I am exceedingly joyful in all our tribulation. 12-year old Zaw Moe Shi of Tapekyi village survived the cyclone by clinging to a tree an entire night. He was the only survivor among his 19-member family. It is feared that, without sufficient relief, hundreds of thousands of survivors may ultimately die in Cyclone Nargis’ aftermath. Our trusted partners have identified 250 Christian families in 47 villages of the Irrawaddy Delta who desperately need our help to survive and start their lives over. We want to provide tin sheets for house roofing ($271 per house), fishing boats ($1,016 each), treadle sewing machines ($131 each), and because most of the people’s oxen drowned in the cyclone, walk-behind tractors that can be shared for plowing rice fields ($2,388 each). We have also learned of many damaged Christian orphanages that need repair. Tariq Zubair (not his actual name) lives in a remote region of an Islamic nation. Since childhood he had a desire to know God, but where he lives, the only two options are fundamental Islam and radical Islam. So Tariq spent many years studying Islamic books. He received training in Jihad (“holy war’) and eventually worked at a Islamic seminary as an assistant to an Imam. One day Tariq discovered his Imam drunk and sexually abusing a young boy. He was invited to join in the “fun.” Tariq rebuked his Imam, but was told, “Our religion is very broad and provides much relaxation, much more than other religions. We can marry four women and do anything we want as long as we make a pilgrimage to Mecca where our sins are forgiven. Our holy book fulfills the needs of men.” That sad incident motivated Tariq to quit his job and continue his search for truth. Tariq already knew of some biblical characters and incidents from reading the Qur’an, and his search led him to borrow a Bible to investigate Christianity. Reading it sparked his faith, and he told his wife and children, who also believed. Tariq dreamed of following Jesus, but didn’t think it was possible for anyone to do that where he lived without soon being murdered. However, while attending a wedding in a different province of his country, he shared his heart with some Christians who were present. Through our network, we learned about him. Pray for Tariq and his family, as we’re providing funds to help them relocate to another part of their country where they can start their lives over, following Jesus without fear of being murdered by Muslims who know they’ve converted. We also hope to provide start-up capital so that Tariq can open a business that will provide for his family. On behalf of Tariq, his wife and children, thanks so much. We have several other recently-converted families, secret disciples of Jesus, who are waiting for our help. One Saturday morning last year, Tamil pastor Nallathamby Gnanaseelan took his wife, Mary Beula, and their nine-year old daughter, Miriam, who was somewhat ill, to the hospital in his home city of Jaffna in northern Sri Lanka. They traveled together on his motorcycle. After dropping them off, he headed for a local church where he would be participating in an all-day prayer and fasting meeting. But he would never make it to that gathering. The city of Jaffna, previously held by Tamil separatists, was taken back by the Sri Lankan army in 1995, and the army’s presence is still very visible there. Soldiers often stop cars on roads to check drivers for proper documents and for questioning (this happened to me many times when I visited Jaffna last year). There is always tension in the air, as soldiers are wary of Tamil rebel activity, and horrible atrocities have been committed by both Tamil separatists and Sri Lankan soldiers. People often just “disappear,” and their bodies are never found. There is a curfew at 7PM each night, but usually, no one travels anywhere after 5PM. Pastor Gnanaseelan was stopped by Sri Lankan police on his way to the church. Eyewitnesses said that one of the soldiers shot him in the leg and stomach at close range. He fell from his motorcycle, and was then shot at point-blank range in the head. They then stripped him of all identification, took his motorcycle, and left him dead in the road. When later questioned, the soldiers claimed that they shot Rev. Gnanaseelan in self-defense when he pulled a grenade from his pocket. They later changed their unbelievable story of a law-abiding local pastor carrying a grenade, claiming that he refused to stop when told to do so. Pastor Gnanaseelan’s widow and family have not received any justice, but when one member of Christ’s body suffers, we all suffer. Because of gifts to our Widows Fund, Heaven’s Family has been able to provide Mary with $500 to start a small shop that will enable her to support her children. Thank you for helping to relieve the suffering of a precious family in Sri Lanka who also love our Lord Jesus. Two other Christian widows helped last month, in Sri Lanka and Burundi, with business start-up grants from the Widows Fund, and one from Pakistan, helped with rice. When associate minister Chuck King became consumed with providing safe water for our spiritual family around the world, I thought he was either losing his mind or gaining more of the Holy Spirit. It has turned out that the latter was the case. Chuck sought and found a simple technology used to make what is called a “biosand filter.” A biosand filter can be constructed for about $50, including labor, with materials found just about anywhere in the world. The main ingredient is sand, carefully layered, through which contaminated water flows. Pure, safe drinking water is the result. While Chuck was teaching pastors in Kenya and Rwanda in July, he also taught a team how to construct biosand filters using seed money from the Safe Water Fund. Profits from the sale of those affordable filters will be used to perpetuate the training of others to build the filters, thus creating jobs and multiplying the distribution of biosand filters across East Africa. In Kenya, a one-time grant of $1,500 provides enough materials to make twenty filters as well as all the start-up equipment needed to construct hundreds more, such as a steel mold in which to pour concrete. Chuck also distributed to pastors some of the 5,000 Swahili copies of The Disciple-Making Minister that were just printed in Kenya. He also provided food for needy Christian widows with gifts to our Widow’s Fund, gave bicycles to church-planting pastors with gifts to our Mobilize a Minister Fund, and provided some basic necessities for displaced believers living in a refugee camp with gifts to our Christian Refugees Fund. All this was made possible by caring Christians. Chuck is an amazing man of God and Heaven’s Family could use ten more like him. To learn all the details of Chuck’s fruitful time in East Africa, visit frontierharvestministries.blogspot.com. Early morning filming where the buffalo roam, literally. We had to be careful where we stepped! You probably realize that the television landscape is quickly changing with the increase of streaming video on the internet. The playing field has been leveled, and we’re happy to take advantage of a technology that makes it possible for little guys like us to broadcast video teaching all over the globe. I spent part of June in South Dakota’s Black Hills at a family reunion and filming thirteen 30-minute teachings through some of Jesus’ most significant parables. You can view one of those teachings of Jesus’ Parables online. The rest are now being edited to post on our website along with the 21 episodes that are already posted there of teaching through Jesus’ Sermon on the Mount. Much more is in the works. The Heaven’s Family Mutual Fund: Eternal Dividends! Heaven’s Family has so many worthy projects that our friends sometimes have trouble deciding where to designate their contributions. For them, we’ve created the Heaven’s Family Mutual Fund. Each monthly “share” of $45 is divided among Heaven’s Family’s three divisions: Orphan’s Tear, I Was Hungry and Shepherd Serve. $20 supports one orphan, $15 meets some of the most pressing needs from among the I Was Hungry family of funds, and $10 puts copies of The Disciple-Making Minister into the hands of pastors all over the world. You can learn more or start investing in the Heaven’s Family Mutual Fund online. This update only tells a small fraction of what is happening through the ministry of Heaven’s Family around the world because of your compassion. 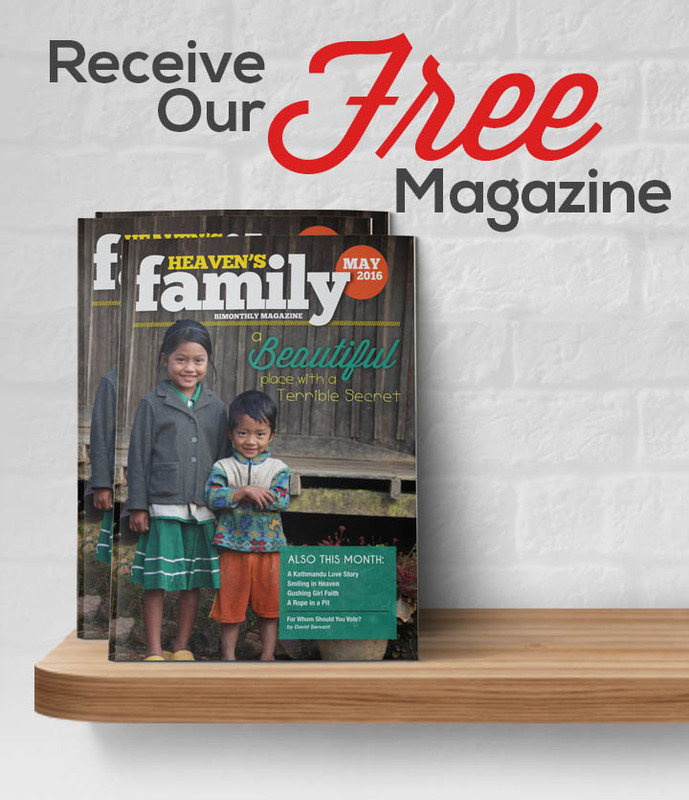 For more information, visit Heaven’s Family. As you read this, David has just returned with a team of ten from a time of ministry in the Eastern European nations of Romania and Moldova. Chuck King is in China serving underground pastors. Your prayers are always appreciated. My friend, Vinh Duong Quang, is a hard-working church planter in communist Vietnam. He is also very efficient. The above baptism of 15 very new believers recently took place in north Vietnam at a popular waterfall before hundreds of tourists. Rather than baptizing them individually, Vinh baptized all 15 at one time!